How Nonprofits, Self-Funding Candidates Made A Mark On The 2018 Primary Races That Will Help Shape Lansing In 2019. LANSING (SEPT. 14, 2018) — A handful of big-spending candidates, two active nonprofits and a slew of open seats in the Michigan Senate led to expensive primary races across the state this summer. In 2014, the last time all 38 seats in the Senate were on the ballot, there were three races where the candidates’ campaigns combined to spend more than $400,000 — those totals don't include other spenders working independently of the campaigns. The Michigan Campaign Finance Network identified the numbers as “unusually high spending totals” for primaries. For 2018, there were four primary races for the Senate where the candidates combined to spend more than $500,000. When outside spending is included, there were four primary races that cost more than $600,000. And the final numbers aren’t in yet. To create a list of the eight most expensive primary races for the Michigan Legislature for 2018, MCFN analyzed candidate campaign spending disclosures through Aug. 27 (the primary was Aug. 7), disclosed independent spending through July 20 and broadcast TV ad-tracking data from Kantar Media/CMAG. Reports on independent spending that happened from July 21 through the Aug. 7 primary election won’t be available until late October. At that point, MCFN will update the numbers. Of the eight most expensive primary races for the seats in the Legislature, seven of them were races for open seats in the state Senate. There are 38 seats in the Senate. At least 28 of them will be in the hands of newcomers in 2019. The following is a breakdown of the eight most expensive primary races we’ve tracked so far and where some of the money has come from. Click on the district to see information on the top donors to each candidate and how much each candidate reported raising. The most expensive Democratic primary race was in the Ann Arbor-based 18th Senate District. There, Jeff Irwin, a former state House member, won despite being outspent by one of his opponents. Irwin’s campaign reported spending $166,520. The campaign of Washtenaw County Commissioner Michelle Deatrick spent twice that, $349,806, according to campaign finance reports. The majority of Deatrick’s money — she raised $371,703 — came from the candidate or her husband. They gave about $317,000, according to disclosures. Two other candidates, Anuja Rajenda and Matthew Miller, spent $153,778 and $8,056, respectively. While self-funders came up in multiple districts this summer, Roger Victory, a state House member from Hudsonville, won the GOP nomination in the 30th District. His campaign raised $262,703 with $184,700 contributed by Victory. The campaign spent $262,104 on the primary. The top spender in the race was the campaign of Daniela Garcia, a state House member from Holland. Her campaign reported spending $287,308 and also received outside support from the Great Lakes Education Project. Former Rep. Joe Haveman’s campaign spent $102,304. The personal giving of Rep. Holly Hughes, a Republican from Montague, helped make West Michigan’s 34th Senate District GOP primary one of the most expensive primary races of 2018. According to campaign finance reports, Hughes gave her own campaign a net amount of about $281,048 — she contributed $1.03 million but repaid herself $750,000 before the election. The DeVos family chipped in $12,000 for Hughes, and the DeVos-supported Great Lakes Education Project backed Hughes independently. Hughes’ campaign spent $402,976 but she lost to Jon Bumstead, a former House member from Newaygo. His campaign spent $193,939. He got outside support from the Safari Club and the Michigan Conservative Coalition, which ran about $8,000 in ads critical of Hughes. In the 19th District, a well-funded ear, nose and throat doctor and a well-funded chiropractor squared off for the Republican nomination. John Bizon, the ear, nose and throat doctor, won. Bizon, a current House member from Battle Creek, relied heavily on self-funding. He gave his campaign $190,000, according to campaign finance disclosures. His campaign spent $244,202. He also received independent support from the Great Lakes Education Project. The campaign of his opponent, Michael Callton, a former House member from Nashville, spent $289,872. Among his top donors was the Michigan Association of Chiropractors PAC, which gave $16,600. Callton also benefited from $75,000 in positive broadcast TV advertisements from the nonprofit group Citizens for Energizing Michigan’s Economy, which has previously been funded by Consumers Energy. The 31st District race makes this list because of the involvement of a nonprofit organization called Faithful Conservatives for Michigan. The organization, which doesn’t have to disclose where its money came from, spent an estimated $264,000 on broadcast ads critical of one candidate, Gary Glenn, or favorable toward the other, Kevin Daley. The group’s estimated spending total doesn’t include the organization’s other expenditures on mailers or radio ads, which would drive the actual cost of the race up further. The campaign of Daley, a former House member from Lum, spent just $102,883. The campaign of Glenn, a current House member from Larkin Township, spent $231,076. Daley ended up winning the nomination. Outside groups played a big role in Southwest Michigan’s 26th District race. There, the Michigan Realtors spent $65,394 to support Aric Nesbitt, a former House member from Lawton, and the nonprofit Citizens for Energizing Michigan’s Economy spent $65,000 on broadcast TV ads to promote him. Nesbitt’s campaign spent $221,435. Nesbitt, the former House Energy Committee chairman, won the nomination. The campaigns of his opponents, Bob Genetski and Don Wickstra, reported spending $67,468 and $168,267 respectively. Southwest Michigan also saw the most expensive primary race for the Michigan state House. In the 63rd District, Rep. David Maturen, of Vicksburg, lost his bid for re-election to conservative challenger Matt Hall. Maturen’s campaign spent $132,158. He benefited from $30,000 in independent spending from the Michigan Realtors and $65,000 in positive TV ads aired by Citizens for Energizing Michigan’s Economy. Hall’s campaign spent $162,997. His campaign raised $209,476 with $176,486 coming from the candidate. A PAC called Value for Michigan chipped in $5,000. The PAC, based in Grand Rapids, won’t have to report where its money came from until Oct. 25. A buffet of interest groups spent money to try to influence the voters of Mid-Michigan’s 24th Senate District, where two state House members faced off for the GOP nomination. Tom Barrett, of Potterville, won the race. His campaign shelled out $197,306. The Michigan Realtors ($30,000), the Michigan Chamber of Commerce ($15,040) and the Great Lakes Education Project ($5,684) all reported spending money independently of Barrett to try to help Barrett’s chances. The Realtors PAC also gave $20,000 to Barrett’s campaign. 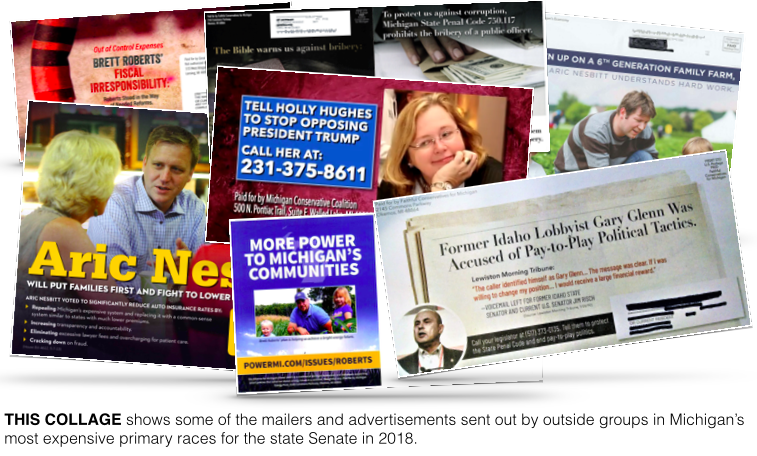 Barrett’s opponent, Brett Roberts, of Eaton Township, benefited from mailers sent out by groups called the Alliance for Michigan Power, Policy Over Party and the Conservative Leadership and Values Coalition. Roberts’ campaign spent $168,279. Of the money the campaign raised, $75,500 came from Roberts himself.